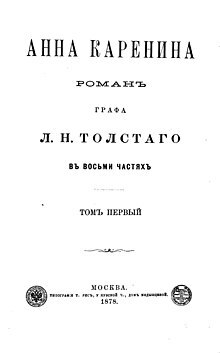 Cover page o the first volume o Anna Karenina. Moscow, 1878. Anna Karenina (Roushie: «Анна Каренина»; Roushie pronunciation: [ˈanːə kɐˈrʲenʲɪnə]) is a novelle bi the Roushie writer Leo Tolstoy, published in serial installments frae 1873 tae 1877 in the periodical The Roushie Messenger. ↑ Nabokov, Vladimir (1980). Lectures on Russian Literature. New York: Harvest. p. 137 (note). ISBN 0-15-649591-0. This page wis last eeditit on 27 Mairch 2017, at 20:59.